• Purchase 2 syringes of Voluma, and receive 1 syringe of JUVÉDERM® Ultra FREE! • Purchase 1 syringe of JUVÉDERM® Ultra Plus, and receive 1 syringe of JUVÉDERM® Ultra at 50% off! No banking product. All treatments must be done by 12/15/15. • Purchase LHR chin package ($750) and receive upper lip package FREE! • Purchase LHR bikini package ($900) and receive underarm package FREE! • Skin prep peel followed by Rejuvapen treatment. • 2-3 weeks later receive a Laser Genesis treatment (stimulates collagen regrowth, reduces redness, pores, and improves skin texture). 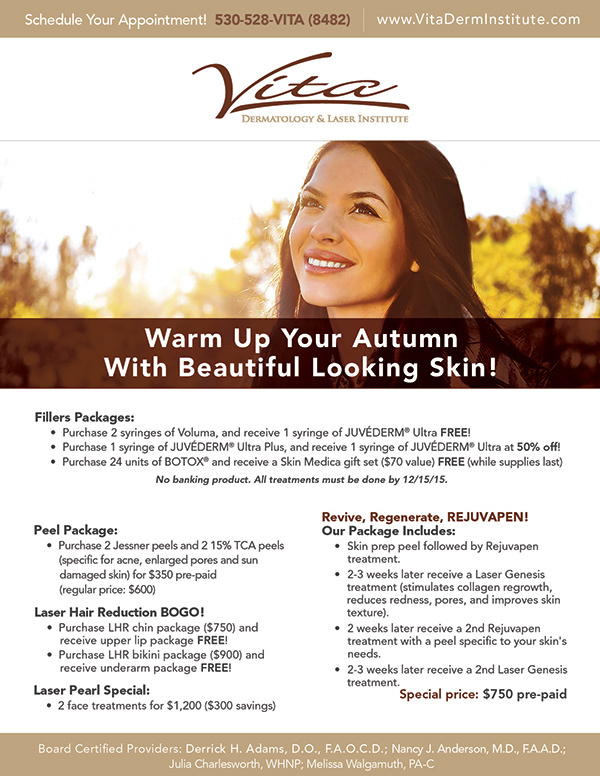 • 2 weeks later receive a 2nd Rejuvapen treatment with a peel specific to your skin’s needs. • 2-3 weeks later receive a 2nd Laser Genesis treatment. Botox offers a non-surgical and affordable way to reduce crow’s feet and lines. Many can experience a more youthful appearance as a result of Botox. JUVÉDERM® can reduce wrinkles and give skin a younger, more smooth and supple appearance. TCA Peels improve your skin by removing the damaged surface layer. They can help with acne, scars, age and liver spots, wrinkles & lines, freckles, irregular skin pigmentation, rough skin, sun-damage, and large pores. Rejuvapen enhances the production of collagen which can help reverse the signs of sun damage, reduce the appearance of acne scars and stretch marks, and create an overall healthier appearance of the skin.